Do you want to get involved with Midwest AARST? Becoming a member is easy! 3 Mini-grants ($500 to $1000) will be awarded at the Annual MWAARST Conference. 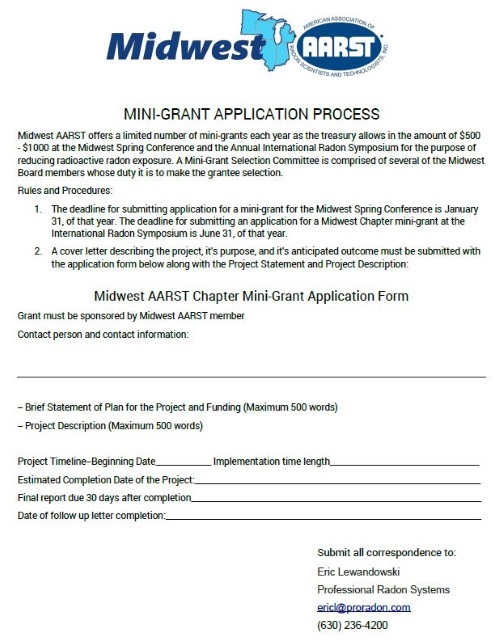 Midwest AARST offers a limited number of mini-grants each year as the treasury allows in the amount of $500 – $1000 at the Midwest Spring Conference and the Annual International Radon Symposium for the purpose of reducing radioactive radon exposure. A Mini-Grant Selection Committee is comprised of several of the Midwest Board members whose duty it is to make the grantee selection. Copyright © 2015. Midwest AARST. All Rights Reserved.